ZYDO open ring from the Luminal Collection. Prong-set diamonds form three flowers. 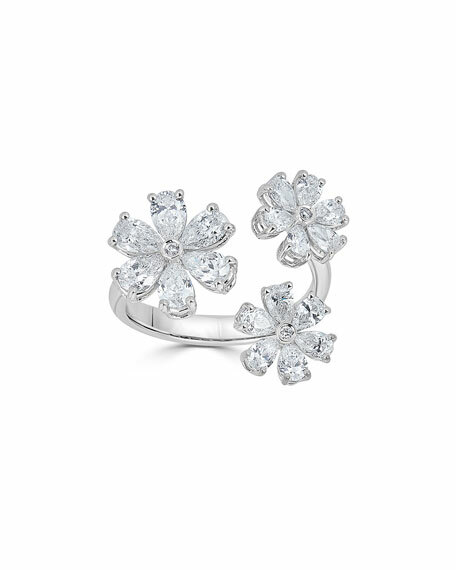 Round diamond centers with six petals. Armenta ring from the Old World Collection. Oxidized sterling silver and 18-karat yellow gold. Scalloped rectangle frame with crivelli canopy. Armenta ring from the Old World Collection. Oxidized sterling silver and 18-karat yellow gold. Scalloped rectangle frame with crivelli canopy. Champagne diamond accents with black and white sapphires. 0.53 total diamond carat weight. Face, approx. 20mm (0.8"L). Made in USA.